A funeral is a ceremony marking a person's death. Funerary customs comprise the complex of beliefs and practices used by a culture to remember the dead, from the funeral itself, to various monuments, prayers, and rituals undertaken in their honor. These customs vary widely between cultures, and between religious affiliations within cultures. In some cultures the dead are venerated; this is commonly called ancestor worship. 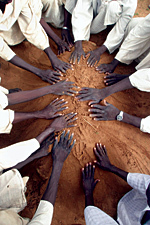 Funeral rites can be traced back to the most primitive of societies. In the Shanidar cave in Iraq, Neanderthal skeletons have been discovered with a characteristic layer of pollen, which suggests that Neanderthals buried the dead with gifts of flowers. This has been interpreted as suggesting that Neanderthals believed in an afterlife, were capable of mourning and most likely held some form of funeral ceremony when doing so. As the final ceremony in which those still alive can share on the earth with their loved ones, the funeral is a deeply meaningful event to all involved. Religious traditions reflect a variety of beliefs in death and the afterlife, and the relationship between the body left behind and its spirit. In many cases, despite feelings of loss, the funeral is a celebration of the life of the deceased. A lithographic painting depicting a Muslim funeral procession in India, circa 1888. The word funeral comes from the Latin funus, which had a variety of meanings, often referring to the corpse and the funerary rites themselves. The most simple and natural kind of funeral monuments, and therefore the most ancient and universal, consist of a mound of earth, or a heap of stones, raised over the body or ashes of the departed. Mention of such monuments has been made in the Book of Joshua, and in Homer and Virgil. A place of burial amongst the Jews was never particularly determined. Ancient Jews had burial-places upon the highways, in gardens, and upon mountains. In the Hebrew Bible, or the Christian Old Testament, Abraham was buried with Sarah, his wife, in the cave in Machpelah, the field he bought from Ephron the Hittite. David, king of Israel, and the other kings after him, including Uzziah of Judah, "rested with [their] ancestors" in the unknown burial field that pertained to the kings. Primitive Greeks were buried in places prepared for burial purposes within their own homes. Later they established burial grounds in desert islands, and outside the walls of towns in order to secure them from disturbance, and themselves from the liability of catching infection from those who had died of contagious disorders. 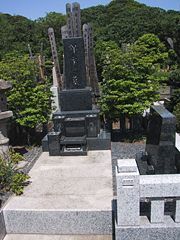 In Japanese history, famous leaders were often buried in tombs. The oldest known burial chamber was that built between 230 B.C.E. and 220 B.C.E. in Sakurai, Nara prefecture, and called the Hokenoyama tomb. The tomb is 80 meters long; the chamber is seven meters long and 2.7 meters wide and contained a coffin five meters long and one meter wide. Many societies, stemming from the ancient Greeks and Romans to seventeenth century British, hired professional “mutes” and “mourners” to attend various funeral ceremonies an act the part of an appropriate attendee. The role of funeral mute is quite frequently depicted in art, but in literature may be best known from Charles Dickens' "Oliver Twist." The main purpose of a funeral mute was to attend funerals wearing a sad, melancholy expression. The professional mourner, generally a woman, would shriek and wail, to encourage others to weep. These positions—mentioned in ancient Greek plays—were employed throughout Europe until the practice largely died out in the nineteenth century. Some of these funerary roles continue to exist in parts of Africa and the Middle East. In most cultural groups and regions, including the United States, Canada and Great Britain, the funeral rituals can be divided into three parts including a visitation, funeral, and burial service. At the visitation, "viewing" or "wake," the embalmed body of the deceased person is placed on display in a coffin or casket. 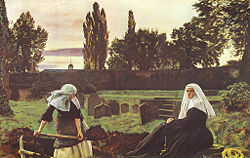 The viewing often takes place on one or two evenings before the funeral. The body is traditionally dressed in the decedent's best clothes, which may be slit up the back to facilitate dressing the body. In recent times there has been more variation in what the decedent is dressed in. The body may also be adorned with the usual jewelry, including a watch. The jewelry and watch will remain in the casket after burial, but removed before cremation. Frequently, attendees of the wake may sign a book kept by the deceased's survivors to record who attended the wake. In addition, a family may choose to display photographs taken of the deceased person during his or her lifetime, prized possessions belonging to the deceased or other items representing his or her hobbies or accomplishments. The viewing can be either "open casket," in which the embalmed body of the deceased has been clothed and treated with cosmetics for display, or "closed casket," in which the coffin is closed. The coffin may be closed if the body suffered damage in death, was deformed from illness, or if someone in the group is emotionally unable to cope with viewing the corpse. The decedent's closest friends and relatives who are unable to attend frequently send flowers to the viewing. The viewing typically takes place at a funeral home, or church. In some circumstances the body is taken to the decedent’s home or that of a relative for viewing. The viewing often ends with a prayer service. The memorial service, often called a funeral, is generally officiated by clergy from the decedent's or bereaved's church or religion. A funeral may take place at either a funeral home or church. A funeral is usually held three to five days after the death of the deceased. The deceased is usually transported from the funeral home to a church in a hearse, a specialized vehicle designed to carry casketed remains. The deceased most often is transported in a procession, with the hearse, funeral service vehicles, and private automobiles traveling in a procession to the church or other location where the services will be held. In a number of jurisdictions, special laws cover funeral processions, such as requiring other vehicles to give right-of-way to a funeral procession. Funeral service vehicles may be equipped with light bars and special flashers to increase their visibility on the roads. After the funeral service, if the deceased is to be buried the funeral procession will proceed to a cemetery if not already there. If the deceased is to be cremated the funeral procession may then proceed to the crematory. Funeral services include prayers, readings from the Bible or other sacred texts, hymns sung either by the attendees or a hired vocalist, or words of comfort by the clergy. Frequently, a relative or close friend will be asked to give a eulogy, which details happy memories and accomplishments. Sometimes the delivering of the eulogy is done by the clergy. During funerals, bagpipes are sometimes played. During the funeral and at the burial service, the casket may be covered with a large arrangement of flowers, called a casket spray. If the decedent served in a branch of the Armed forces, the casket may be covered with a national flag. A burial service is conducted at the side of the grave, tomb, mausoleum, or crematorium, at which the body of the decedent is buried or cremated. Sometimes, the burial service will immediately follow the funeral, in which case a funeral procession travels from the site of the memorial service to the burial site. Other times, the burial service takes place at a later time, when the final resting place is ready. If the decedent served in a branch of the Armed forces, military rites are often accorded at the burial service. In many religious traditions, pallbearers, usually males who are close, but not immediate relatives, such as cousins, nephews, or grandchildren, or friends of the decedent, will carry the casket to the hearse, and from the hearse to the site of the burial service. According to most religions, coffins are kept closed during the burial ceremony. In Eastern Orthodox funerals, the coffins are reopened just before burial to allow loved ones to look at the deceased one last time and give their final farewells. Morticians will typically ensure that all jewelry that was displayed at the wake is in the casket before it is buried or entombed. There is an exception, in the case of cremation. Such items tend to melt or suffer damage, so they are usually removed before the body goes into the furnace. In many traditions, a meal or other gathering often follows the burial service. This gathering may be held at the decedent's church or another off-site location. Some funeral homes have large spaces set aside to provide funeral dinners. On occasion, the family of the deceased may wish to hold a small service, with just the decedent's closest family members and friends attending. 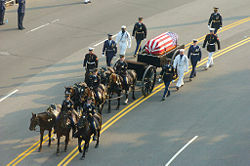 This type of ceremony is often closed to the public, and one may only go to the funeral if he or she was invited. Reasons vary but may include the burial of an infant, the burial of a criminal, general emotional shock, or celebrity status. If a state funeral is offered and accepted by the decedent's immediate family, a public funeral would ensue. In some cases, the family may schedule a private funeral with a public memorial service at a later time. Traditional etiquette often holds that mourners and other attendees at a funeral wear semi-formal clothing, such as a suit and tie for men or a dress for women. The most traditional and respectful color is solid black. Wearing short skirts, low-cut tops, or, at Western funerals, a large amount of white other than a men's business shirt or woman's blouse, or a military uniform, is often seen as disrespectful. Women who are grieving the death of their husband or a close partner sometimes wear a dark veil that conceals the face. In ancient Rome, the eldest surviving male of the household, or the pater familias, was summoned to the death-bed, where he attempted to catch and inhale the last breath of the decedent. Roman funerals of the socially prominent were usually undertaken by professional undertakers called libitinarii. Though no direct description has been passed down of Roman funeral rites, these rites are believed to have included a public procession to the tomb or pyre where the body was to be cremated. The most noteworthy thing about this procession was that the survivors bore masks bearing the images of the family's deceased ancestors. The right to carry the masks in public was eventually restricted to families prominent enough to have held curule magistracies. Mimes, dancers, and musicians hired by the undertakers, as well as professional female mourners, took part in these processions. Less well to do Romans could join benevolent funerary societies, or collegia funeraticia, who undertook these rites on their behalf. Nine days after the disposal of the body, by burial or cremation, a feast was given, called a cena novendialis, and a libation poured over the grave or the ashes. Since most Romans were cremated, the ashes were typically collected in an urn and placed in a niche in a collective tomb called a columbarium. During this nine day period, the house was considered to be tainted, or funesta, and was hung with yew or cypress branches to warn by passers. At the end of the period, the house was swept in an attempt to purge it of the dead person's spirit. The Romans prohibited burning or burying in the city, both from a sacred and civil consideration, so that the priests might not be contaminated by touching a dead body, and so that houses would not be endangered by funeral fires. Among Christians, a Catholic funeral refers to the funeral rites specifically in use in the Roman Catholic Church. Within the church, they may also be referred to as ecclesiastical funerals. In Catholic funerals, the church seeks to provide spiritual support for the deceased and honor their bodies, as well as provide a measure of hope for the family and friends of the deceased. In the years before the Second Vatican Council the rites used were different than those used today. The Catholic Funeral Mass was originally termed the Requiem Mass. Such Masses had a number of differences from traditional Masses, mainly taking a more solemn character and more of a focus on the sinful nature of humanity and the judgment that came at the end of a life. The priest was vested in the liturgical color black, and no blessing was given. The sequence Dies Iræ, or Day of Wrath, was included in the Mass, which spoke of the upcoming ending of the world and the judgment that followed. After the Second Vatican Council, a number of the rites associated with a funeral were changed; many texts and scriptures were removed which overemphasized judgment, fear, and despair. The modern funeral Mass, or the Mass of Christian Burial focuses on the fact that rather than ending, that life has changed. Instead of the black vestments of previous years, the priest may be vested in white, violet, or, on occasion, black. The Mass consists of the reception of the body at the church, liturgies of the word and Eucharist, and the final committal. Antyesti, or Hindu funeral rites, form an important sacrament of Hindu society. The funeral rites often differ in theory, practice, and procedure depending on the caste, jāti, or the social status of the deceased person. Hindu traditions involve cremation to dispose of the dead. Cremation practices became popular due to the notion that the soul cannot enter a new body until its former one has completely disappeared; cremation was found to be the fastest way to expeditiously dispose of such bodies. Hindu funeral rites are often divided into four stages. The first stage is comprised of all rituals and rights to be performed when the body is nearing death. The second state consists of various rites to accompany the disposal of the body after death has occurred. The third stage is comprised of the rites to enable the soul of the dead to transit successfully from the stage of a spirit to the realm of the ancestors. The last stage is comprised of the rites performed in honor of the Pitrs. Hindu procedures for cremation vary from place to place. Generally, after death, the body is placed on the floor with the head pointing north which marks the direction of the dead. An oil lamp is lit and placed near the body and is kept burning continuously for the first three days following the death. In Hinduism, the dead body is considered to be symbol of great impurity and there is minimal physical contact with the dead body by the living. Most often the dead body is bathed in purified water, and dressed in new clothes. Sacred ash “bhasma” is applied to the forehead of the deceased. Further, drops of the holy Ganges water may be put into the mouth of the deceased so that the soul may attain liberation, while leaves of the holy basil “tulsi” are placed to the right of the body. The body may then be adorned with jewels and placed on a stretcher. The stretcher is adorned with different flowers including roses, jasmine, and marigolds; the body itself is almost completely covered with flowers. Thereafter, the close relatives of the deceased person carry the stretcher on their shoulders to the cremation ground. The cremation ground is traditionally located near a river, if not on the river bank itself. There, a pyre is prepared, on which the corpse is laid. The jewels, if any, are removed. Thereafter, the chief mourner, generally the eldest son, walks around the pyre three times keeping the body to his left. While walking he sprinkles water and sometimes ghee onto the pyre from a vessel. He then sets the pyre alight with a torch of flame. The beginning of the cremation heralds the start of the traditional mourning period, which usually ends on the morning of the thirteenth day after death. When the fire consumes the body, which may take a few hours, the mourners return home. One or two days after the funeral, the chief mourner returns to the cremation ground to collect the mortal remains and put them in an urn. These remains are then immersed into a body of water, usually a river. 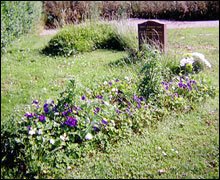 Burial grave of a Muslim. Islamic funerals follow specific rites and rituals for burying the dead, and are performed as soon as possible following death. The first of such rituals is to bathe the dead body to physically cleanse the corpse. The second is to enshroud the body in a simple plain cloth, known as coffin cloth or kafan. The main factor in this step is to respectfully wrap the corpse in a cloth so that its private parts are not visible to others. This is followed by a traditional funeral prayer in which the Muslims of the community gather to offer collective prayers for the forgiveness of the dead. This prayer has been generally termed as the Janazah prayer. The next stage consists of the burial of the body in a grave, positioning the deceased’s head toward Mecca in a grave aligned on a northeast to southwest axis. The wrapped body is placed directly into the ground, without any kind of casket. Muslim graves are to be raised between four and twelve inches from the ground. This is to prevent anyone from sitting or walking on the grave, which is strictly forbidden. Graves markers are simple as outwardly lavish displays are discouraged; some graves are left unmarked, or marked only with a simple wreath. Only men are allowed to attend the actual graveside service. Loved ones and relatives are to observe a three-day mourning period. Mourning is observed in Islam by increased devotion, receiving visitors and condolences, and avoiding decorative clothing and jewelry. Widows observe an extended mourning period, or Iddah, lasting four months and ten days long. During this time, the widow is not to remarry, move from her home, or wear decorative clothing or jewelry. Bereavement in Judaism is a combination of minhag, or "traditional custom," and mitzvot, or "commandments" derived from Judaism's classical Torah and rabbinic texts. However, the details of observance and practice vary according to each Jewish community. 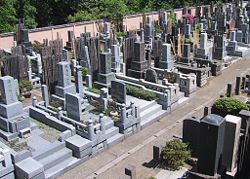 After death, a chevra kadisha which acts as a burial society, is loosely structured to organize Jewish men and women to ensure the bodies of Jews are prepared for burial according to Jewish law. Members ensure that the bodies of the deceased are protected from desecration, willful or not, until burial. Two of the main requirements are the showing of proper respect for the body of the deceased, and the ritual cleansing of the body and dressing for burial. 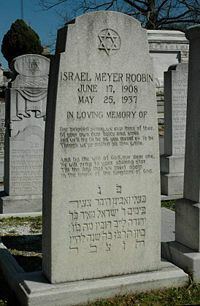 Tombstone in the "new Jewish section" of Oakland Cemetery in Atlanta, GA. Many burial societies hold one or two annual fast days and organize regular study sessions to remain up to date with the relevant articles of Jewish law. In addition, most burial societies also support families during the shiva, or traditional week of mourning, by arranging prayer services, preparing meals, and providing other services for the mourners. The three major stages to preparing the body for burial include washing, ritual purification, and dressing. First, the body is uncovered and carefully washed. As all blood must be buried along with the deceased, any open bleeding is stopped. The body is thoroughly cleaned of dirt, body fluids and solids, and anything else that may be on the skin. All jewelry is removed. The body is then purified with water, either by immersion in a mikvah or by pouring a continuous stream in a prescribed manner. The body is then dried and dressed in traditional burial clothing, or tachrichim. A sash is wrapped around the clothing and tied in the form of the Hebrew letter "shin," representing one of the names of God. If a coffin is used, it is prepared by removing any linings or other embellishments. The body is then lifted into the coffin and wrapped in a prayer shawl or sheet. Soil from Israel, if available, is placed over various parts of the body and sprinkled in the coffin. The coffin is closed and sealed; in Judaism there is traditionally no viewing of the body and no "open casket" at the funeral. If the body is not taken immediately for burial, guards or watchers known as shomrim will sit with the coffin until it is taken for burial. It is traditional to recite Psalms during this time. Before the burial, it is common that several people speak at the start of the ceremony at the funeral home, as well as prior to burial at the gravesite. The Torah requires burial as soon as possible. This means that burial will usually take place on the same day as death, or, if not possible, the day following. Typically, when the funeral service has ended, the mourners come forward to fill the grave. Symbolically, this gives the mourners closure as they observe the grave being filled in. One custom is for people present at the funeral to take a spade or shovel, held pointing down instead of up, to show the antithesis of death to life and that this use of the shovel is different from all other uses, to throw three shovelfuls of dirt into the grave. Mourners traditionally make a tear in an outer garment either before the funeral or immediately after it. The tear should be on the left side for a parent, over the heart and clearly visible, and on the right side for brothers, sisters, children, and spouses. Mourners do not shower or bathe for a week, do not wear leather shoes or jewelry, men do not shave, and in many communities large wall mirrors in the mourners' home are covered. During this time distant family and friends come to visit or call the mourners to comfort them via shiva calls. Most Jewish communities have an unveiling ceremony a year after the death in which the headstone or tombstone is unveiled. A Japanese funeral includes a wake, the cremation of the deceased, a burial in a family grave, and a periodic memorial service. Nearly all deceased Japanese are cremated. Most of these are then buried in a family grave, but the scattering of ashes has become more popular in recent years, including a burial at sea and even on rare occasions a burial in space. While Japan has a mixture of Shinto and Buddhist beliefs, funerals are almost always Buddhist ceremonies. After death, the deceased's lips are moistened with water, in a ceremony called Matsugo-no-mizu, meaning "Water of the last moment." The household shrine is closed and covered with a white paper, to keep out the impure spirits of the dead. This is called Kamidana-fuji. A small table decorated with flowers, incense, and a candle is placed next to the deceased's bed. A knife may be put on the chest of the deceased to drive away evil spirits. The relatives and the authorities are informed of the death and a death certificate is issued. Organization of the funeral is usually the responsibility of the eldest son. The body is washed and the orifices are blocked with cotton or gauze. The last clothes are usually a suit for males and a kimono for females. Make-up may also be applied to improve the appearance of the body. 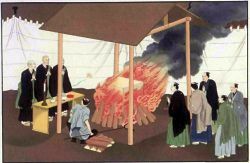 The body is put on dry ice in a casket, and a white kimono, sandals, six coins for the crossing of the River of three hells, and burnable items the deceased was fond of, such as cigarettes and candy, are placed in the casket. The casket is then put on an altar for the wake. While in former times white clothes were worn for funerals, a more recent tradition is for all guests to wear black. A guest will often bring condolence money in a special black and silver decorated envelope. The guests are seated, with the next of kin closest to the front. The Buddhist priest will read a sutra. The family members will each in turn offer incense three times to the incense urn in front of the deceased. The wake ends once the priest has completed the sutra. Each departing guest is given a gift. The closest relatives may stay and keep vigil with the deceased overnight in the same room. The funeral is usually held on the day after the wake. The procedure is similar to the wake, and incense is offered while a priest chants a sutra. The ceremony differs slightly as the deceased receives a new Buddhist name, or kaimyō. This name supposedly prevents the return of the deceased if his name is called. 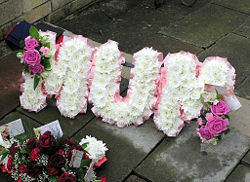 At the end of the funeral ceremony, flowers may be placed in the casket before it is sealed and carried to the elaborately decorated hearse and transported to the crematorium. 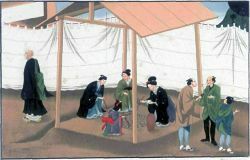 In some regions of Japan, the coffin is nailed shut by the mourners using a stone. If cremated, the coffin is placed on a tray in the crematorium. The family witnesses the sliding of the body into the cremation chamber. A cremation usually takes about two hours, and the family returns at a scheduled time when the cremation has been completed. The relatives pick the bones out of the ashes and transfer them to the urn using chopsticks. The bones of the feet are picked up first, and the bones of the head last. This is to ensure that the deceased is not upside down in the urn. Following burial, a grave monument is erected over the burial plot. The date of the erection of the grave and the name of the person who purchased it may be engraved on the side of the monument. The names of the deceased are often but not always engraved on the front of the monument. The names of the deceased may also be engraved on the left side, or on a separate stone in front of the grave. Often, the name is also written on a sotoba, a separate wooden board on a stand behind or next to the grave. These sotoba may be erected shortly after death, and new ones may be added at certain memorial services. Some graves may also have a box for business cards, where friends and relatives visiting the grave can drop their business card, informing the caretakers of the grave of the respects the visitors have paid to the deceased. According to Unification tradition, death marks the period in which one’s spirit ascends to the spiritual realm, and one’s body returns to the earth. Due to this belief, followers of the Unification tradition do not practice cremation as it prevents the body from returning to its original source. A Unification funeral, known as the Seung Hwa Ceremony, marks a celebration of the deceased’s life beginning in the spiritual world. As such, the ceremony is one of beauty, enlightenment, and joy. According to custom, the casket and all garments worn by the deceased body are sanctified with Holy Salt before the body is placed inside. The body is then dressed in a white Holy Robe, and the hands adorned with white gloves. In addition to personal items, other articles to be placed in the casket include a Divine Principle book, a book of Reverend Sun Myung Moon’s speeches, and the departed’s Holy Handkerchief. 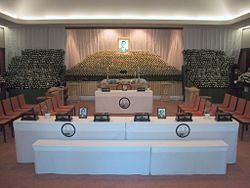 Though the casket is generally left open during the ceremonies, a Unification Church flag is placed over the casket when closed. Attendees of the ceremony follow a general dress code in which women wear white and are adorned with a red flower corsage, and men wear dark blue suits with a white shirt, and carry a white flower. An elder Unificationist often leads the services, opening with a farewell song followed by various prayers and testimonies. At the conclusion of the service, attendees offer one final bow toward the casket, in addition to lighting a stick of incense. A picture of the deceased is often present at the ceremony; this picture is to be carried to the place of burial and put in front of the casket. While at the gravesite, a shorter ceremony of prayers, songs, and sermon is conducted. The casket is lowered into the grave, with flowers placed on top by the attendees, followed by the shoveling of topsoil onto the casket by various family members. On the third day following the burial, family members return to the grave to hold the final ceremony, known as the ceremony of ascension. In most East Asian, South Asian and many Southeast Asian cultures, the wearing of white is symbolic of death. In these societies, white or off-white robes are traditionally worn to symbolize that someone has died and can be seen worn among relatives of the deceased during a funeral ceremony. When the coffin is lowered into the ground the mourners will bow their heads and must not watch the coffin being lowered into the ground. Sometimes, some members of the procession are required to turn their backs and not look at the coffin as it is sealed, entering the carriage, removed from the carriage and entering the ground. They may also be required to wipe their faces with a white cloth. Paper money and commodities constructed out of paper and bamboo are often burnt for the deceased for use in the afterlife. A traditional Chinese gift to the attendees upon entering is a white envelope, usually enclosing a small sum of money, a sweet, and a handkerchief, each with symbolic meaning. Chinese custom also dictates that the said sum of money should not be brought home. The sweet should be consumed that day and anything given during the funeral must not be brought home. The repetition of 'three' is common where people at the funeral may brush their hair three times or spit three times before leaving the funeral to ward off bad luck. This custom is also found in other East Asian and Southeast Asian cultures. 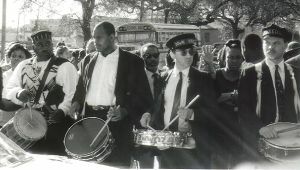 A unique funeral tradition in the United States occurs in New Orleans, Louisiana. The unique tradition arises from African spiritual practices, French martial musical traditions, and uniquely African-American cultural influences. A typical jazz funeral begins with a march by the family, friends, and a jazz band from the home, funeral home or church to the cemetery. Throughout the march, the band plays very somber dirges. Once the final ceremony has taken place, the march proceeds from the cemetery to a gathering place, and the solemn music is replaced by loud, upbeat music and dancing where onlookers join in to celebrate the life of the deceased. This is the origin of the New Orleans dance known as the "second line." Celebrants do a dance-march, frequently raising the hats and umbrellas brought along as protection from intensely hot New Orleans weather and waving handkerchiefs (that are no longer being used to wipe away tears) above their heads. Those with concerns about the effects on the environment of traditional burial or cremation may choose to be buried in a fashion more suited to their beliefs. They may choose to be buried in a coffin made of cardboard or other easily-biodegradable materials. Further, they may choose their final resting place to be in a park or woodland, known as an eco-cemetery, and may have a tree planted over their grave as a contribution to the environment and as a remembrance. A Funeral Home in North Syracuse, New York was the first funeral home to offer and broadcast a visitation and funeral "live" on the Internet. The use of a web-camera allowed relatives who could not otherwise attend services to do so from any computer. Family members and friends separated by distance, weather or circumstance can now become part of the support network by being connected electronically to such ceremonies. Rarer forms of disposal of the dead include excarnation, where the corpse is exposed to the elements. 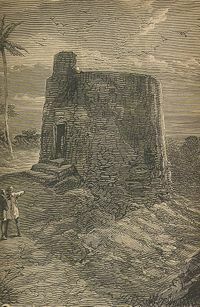 This was practiced by some groups of Native Americans and is still practiced by Zoroastrians in Bombay, where the Towers of Silence allow vultures and other carrion eating birds to dispose of the corpses. Zoroastrianism believes that fire is sacred and should not be defiled by cremating a human body. Excarnation is also practiced by some Tibetan Buddhists and is sometimes called Sky burial. Another way of avoiding some of the rituals and costs of a traditional funeral is for the decedent to donate some or all of her or his body to a medical school or similar institution for the purpose of instruction in anatomy, or for similar purposes. Students of medicine and osteopathy frequently study anatomy from donated cadavers; they are also useful in forensic research. Typically the remains are cremated once the students have completed their anatomy classes, and many medical schools now hold a memorial service at that time as well. ↑ Archdiocese of Milwaukee Catholic Cemeteries, The Mass of Christian Burial "Spiritual Guidance Order of Christian Funerals—Part II." Retrieved April 29, 2015. ↑ Unification Tradition "Deaths, Seung Hwa Ceremony, Funerals." The Tradition, Book One Retrieved September 22, 2007. The American Heritage Dictionary of the English Language, Fourth Edition Funeral. Houghton Mifflin Company, 2004. Answers.com Retrieved April 29, 2015. Amin Ahsan Islahi. Tadabbur-i-Qur'an, second ed., vol. 1, Lahore, Pakistan: Faran Foundation, 1986. Ghamidi, Javed Ahmed. Mizan Dar al-Ishraq, 2001. This page was last modified on 29 April 2015, at 20:10.